Where I come from, there has been a sustained effort over the years to reflect, as much as possible, the pattern left by the church of the First Century. We don’t do things we can’t find authority for in the New Testament, and by and large believe that the church today should shed 2,000 years of add-on s and extras, come out of our denominations, and just be Christians. While it is a work in progress, much has been done to that end. But I’ve got a question for your consideration. Should we make it our goal to be just like the church of the First Century? Should our efforts be directed toward that singular destination? I submit to you that the answer to that question is a definite “no”. Before you panic, here’s what I mean. Doctrinally, we should be just like that church. We should also have a deep sense of fellowship with other believers, and we most certainly should have deep convictions about the Apostles doctrine. I even believe that if we lived it out correctly, that we would see the Lord adding to our number daily, those who were being saved. Do you want a pattern for the Church? Start with that one! But, as wonderful as that is, it’s not our goal. Being just like First Century Christians is a means to an end. It is the path we take, not our destination! You see, the church at Laodicea was also a First Century church. The church at Corinth with its problems with carnal members and weekly chaos, was a First Century church as well. Read about seven First Century churches in Revelation chapter 2 and 3, and you will see that five of them needed to fix things, and two of those were in bad enough shape that Christ did not have anything good to say about them. But sure enough, they were singing acapella, taking the Lords supper, and baptizing for the remission of sins. There is no virtue, in and of itself, in being a First Century church! I repeat, it is just a means to an end. 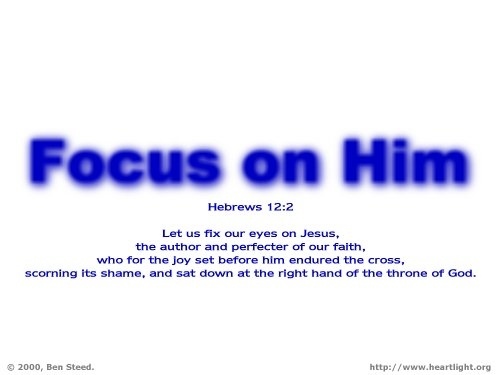 Our ultimate focus has got to be Jesus. When we focus on Jesus we will aim for the correct goals. Our goal as a congregation of believers is to love the Lord our God and show that love in our obedience. And we are to love our neighbors, and show that love in how we treat others. There is a real danger in turning the route into the destination! On the flip side, unless we take the correct route, we will not reach our goal. The two go hand in hand, but they must never be substituted for each other. So yes, we still want to worship in First Century simplicity, and we still will teach the same doctrine as the Apostles. And if we do so in love and with zeal, we will bring many along with us on the way to our eternal destination.